Stellar Lumens Is Growing. What’s Next? 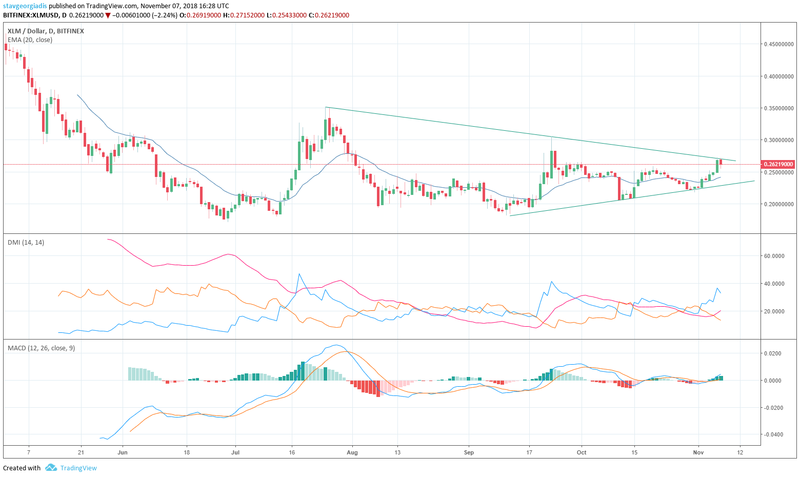 The 6th largest cryptocurrency in the world has recently formed an ascending triangle with higher lows and may be poised for a breakout aiming at $0.35 and then $0.38. Stellar is currently in the sixth position in the top one hundred cryptocurrencies by market capitalization, having a market capitalization of $4.808.965.522 and price of $0,253682 as of Nov. 7, 2018. What’s next? Stellar has recently formed an ascending triangle with higher lows and may be poised for a breakout aiming at $0.35 and then $0.38. The ADX DMI indicator shows a trend that is not very strong with a value of 20.25 for the ADX indicator, but the values of +DI and -DI are 32.92 and 13.35 respectively, showing that the dominant trend on the daily chart is the uptrend. MACD indicator is also positive and rising, while the current price of $0.2620 is above the daily 20-period and the 50-period exponential moving averages show values at 0.2423 and 0.2383 accordingly. The Momentum indicator shows positive signs as it has formed higher lows and is rising, but the Stochastic indicator with values (14,3,3) is in the overbought zone above the 80 level. What are the key levels to monitor for support and resistance? Hello! I noticed that since November 2018, the Stellar's price has dropped significantly, but for me, this coin is still very promising. What do you think about its price by the end of 2019? I have recently found an excellent forecast on this topic, you can look here. According to the best scenario, the price may reach $4 by the end of the year. You are welcome, and what do you think about the XLM's price?